117 traditional Anglicans from across America converged on the Shrine of Our Lady of the Snows, in Belleville, Illinois, for Forward in Faith North America’s (FIFNA) annual Assembly in July. Reflecting FIFNA’s shift away from church politics, the event was themed around prayer and featured three speakers, Bishop Donald Parsons, the retired 6th Bishop of Quincy, Mother Gabriella, Abbess of the Orthodox Monastery of the Dormition, in Michigan and Bishop Alberto Morales, OSB, the Bishop of Quincy. 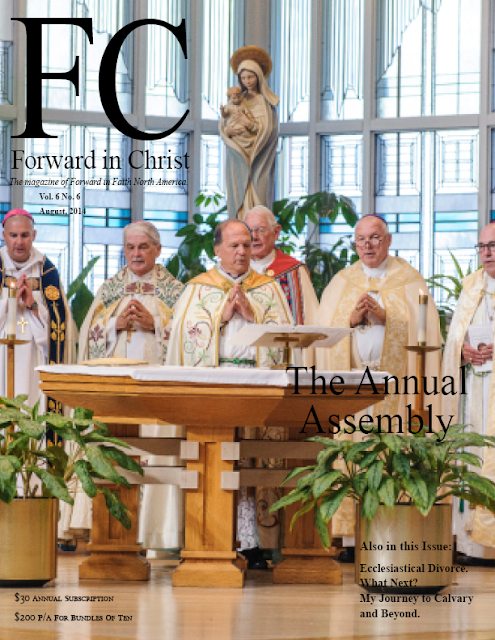 Several members of the FIFNA Council gave reports, notably Forward in Faith’s President, Bishop Keith Ackerman, who announced plans for an international Anglo-Catholic “congress”, which will be held in Fort Worth in July 2015. The purpose of the event is to unite Anglicans from around the world in a common proclamation of catholic identity, practice and mission. Conference organizers hope that the event will work towards a rediscovery of Anglican catholicity and work towards ecumenical dialogue with the Great Churches of the East and West. In an engaging presentation, FIFNA’s Executive Director, Dr. Michael Howell, spoke to Forward in Faith’s history and ethos. “What is Forward in Faith?” asked Howell, “It is the inheritor of the Oxford Movement, proclaiming the historic, catholic faith of the undivided Church.” Dr. Howell also drew attention to FIFNA’s membership; out of some 1,708 signatories of Forward in Faith’s Declaration, a little over 300 persons had paid dues at the time of the Assembly. Speaking to the benefits of membership, the Executive Director highlighted Forward in Faith’s several offerings, including tracts and teaching materials, Forward in Christ magazine, and a voice in the realignment of Anglican Christianity in the U.S. Forward in Faith, Dr. Howell reminded delegates, is a founding member of the Anglican Church in North America. Ecumenical relations were discussed by FIFNA’s Vice President, Bishop William Illgenfritz of the Missionary Diocese of All Saints and Bishop Ray Sutton of the Reformed Episcopal Church. Bishop Illgenfritz spoke of the warm reception given to delegates of the Anglican Church in North America’s 2014 Assembly by the Archabbot of St. Vincent’s Benedictine community in Latrobe, Pennsylvania. Bishop Sutton gave an encouraging report on dialogue with the Orthodox Church, the Polish National Catholic Church and other denominations. Next year’s Assembly will be held at St. Andrew’s church in Fort Worth, Texas, from July 13-17, as a part of an international Anglo-Catholic event. Please pray for its success.